Over the last eighteen years, people on social assistance in Ontario have seen their real income levels fall by 56 per cent. For the last nine years, the Liberal Government of Dalton McGunity, while actually pushing people deeper into poverty, has continued a sham consultation process around “poverty reduction.” Recently, a Commission established by the Liberals issued a report on the “reform” of social assistance. The Ontario Coalition Against Poverty (OCAP) responded with this statement in which it argues that the report is a blueprint for forcing the poor into low waged jobs and pushing down wages for those presently employed. Firstly, just when their seemingly endless round of “consulting stakeholders” on poverty and social assistance seemed to have run out of credibility, the Government is now handed yet another way to divert attention from the obvious fact that their declarations on alleviating poverty have been a sham. Now, they have yet another ‘bold and innovative blueprint’ that they must study and consider so as to prepare the ‘comprehensive and sweeping’ measures they have been meaning to get around to for nine years. It is suggested that single people on Ontario Works should have their income increased by $100 a month in the interim (although this would be paid for by eliminating the Special Diet and other ‘extras’ as social assistance benefits). This year, benefit levels went up by less than the rate of inflation and even this only took place because, as a minority government, they had to abandon a complete rate freeze in order to negotiate the passage of their Budget. This, of course, included brutal cuts for people on social assistance particularly the elimination of the vital Community Start Up and Maintenance Benefit (CSUMB). The cut to the CSUMB is perhaps one of the most blatant examples of how dreadful the policies of the Liberal government have been for poor people. It is a benefit that in reality means the difference between housing and homelessness for thousands of people in Ontario. It is often the only way women in poverty are able to leave abusive situations and start-up somewhere safer. It is also the only way that people on assistance are able to buy the basic necessities like a bed and pots and pans. Still, it would be a mistake to dismiss this report as nothing but a way of diverting attention. It serves the agenda of the Liberals in a very direct and powerful way. The language and form of this report is designed to appeal to the fair and reform minded but its content is meant for those who stand to profit from poverty in the new age of austerity we have entered. The fundamental nature of the welfare system can be traced all the way to its roots in the old English Poor Laws. The system has always been there to reluctantly provide enough assistance to the poor to stave off unrest and social dislocation but to do so at levels and in forms that maximize the flow of labour into the lowest paying and most exploitative jobs on offer. The English Poor Law Reform Commission of 1834 coined the expression “less eligibility” to convey this central aim and function of the system. Brighter Prospects for all its positive spin and utilization of the language of disability advocacy, is a very clear blueprint for the application of less eligibility in the context of post 2008 austerity. The report takes it as a given that the issue must be to prod the poor into paid employment. The explosive growth of the low wage sector and the implications of driving yet more people into a competition for precarious and sub-poverty jobs is not considered. ‘Fairness’ in this instance, of course, means that, however inadequate the minimum wage may be and, however wretched working conditions become for low wage workers, poverty in the form of a paycheque must always seem to be the better option for the poor. The resulting plan for the ‘journey’ to low wage work, “would be based on what you are able to do, and have agreed to do, in consultation with your caseworker.” The authors diplomatically avoid the question of who gets the deciding vote in the event of a disagreement. This greased slope into the low wage ghetto, however, is to be made a lot busier than the Harris prototype ever was. This is because it is to be redesigned so as to include the disabled in huge numbers. Ontario Works (OW) and Ontario Disability Support Program (ODSP) would be merged into one municipally delivered system “focused on ability and not on disability” and the shining pathway to employment is broad enough for everyone. Perish the thought that such pillars of the community would even think of taking advantage of the systemic ableism that faces people with disabilities so as to exploit them as much as possible. In this Province, one worker in six is working at or close to the minimum wage, the Employment Standards Act is weak and its enforcement is a bad joke. In this context, a drive to push poor and disabled people into the lowest paying sections of the job market will not reduce poverty or even unemployment. It will simply create forced competition for precarious, low-wage, and often times dangerous jobs. There will still be a limited supply of jobs, many of them short lived. There will still be more people wanting those jobs than can be employed. The difference will be that those forced into this bidding war will be more desperate and vulnerable even than they are today. The result will be a lowering of conditions and a downward pressure on wages. Then perhaps some future government will commission a new report to design an even more regressive social assistance system that can drag poor and working people down even further. The alternative to this document for austerity is to fight for a system of social assistance that is secure and adequate. This means, above all else, restoring the benefit levels to pre Mike Harris levels ~ an increase of at least 56 per cent. 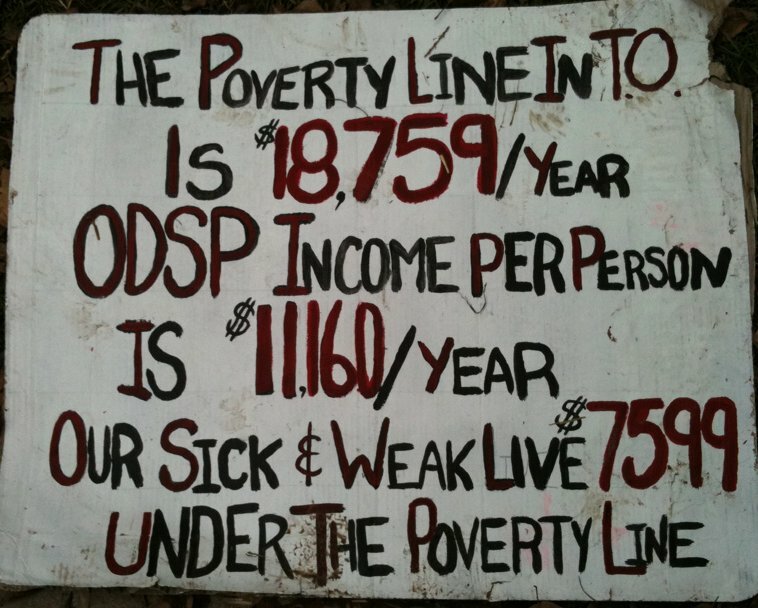 If we can regain some adequacy in OW and ODSP, and reduce the desperation and vulnerability of those forced to turn to them, we can challenge with much greater strength the austerity agenda that fuels the drive to weaken unions and push down wages. As this statement is being finished, news is breaking that our allies in Poverty Makes Us Sick in Kitchener have taken over the constituency office of the Liberal Minister of Community and Social Services, John Milloy, and established an emergency homeless shelter at the site. Across the Province, people are fighting to challenge poverty regardless of whether it comes in the form of a pay cheque or a welfare payment. The Raise the Rates campaign has been building momentum to stop the cut to CSUMB, to reject the notion that the poor should be austerity’s scapegoat, and to build the movement for real income adequacy and justice. We have been working with Canadian Union of Public Employees-Ontario (CUPE), community groups and other labour allies across Ontario, on local events, demonstrations and actions and pushing for mass-access for the benefits that people need. There is a necessity right now to escalate action especially in the lead-up to the anticipated January 1st cut-off of CSUMB. As provincial politicians are no longer even sitting at Queen’s Park, we are taking aim at their constituency offices and ministry offices. As the Liberal Party prepares to elect a new leader at the end of January, their convention should have to face a wave of resistance.